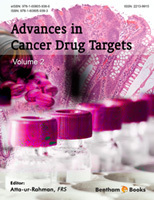 As the discovery and classification of novel human drug targets for anti-cancer drugs continue to grow, the eBook Series “Advances in Cancer Drug Targets” has become essential for all pharmaceutical scientists. This eBook series is a compilation of recent expert reviews published in Current Cancer Drug Targets on the subject with a focus on novel strategies. The current volume covers reviews on contemporary molecular drug targets involved in cancer, including medicinal chemistry, pharmacology, molecular biology, genomics and biochemistry. The 'cancer chaperone’ heat-shock protein 90 (Hsp90) plays a crucial role in maintaining the stability and activity of numerous signaling proteins. In chapter 01, Bruserud et al. explain the role of Heat Shock Protein 90 (HSP90) as a potential target in the treatment of Acute Myelogenous Leukaemia (AML). The HSP90 inhibition targets several intracellular signalling pathways, leading to the degradation of client proteins and hence exhibits multiple antileukaemic effects. This has been comprehensively reviewed. The mitotic spindle assembly checkpoint (SAC) is a vital regulatory system of the eukaryotic cell cycle. Mutations in Spindle Assembly Checkpoint (SAC) lead to a condition that is associated with various types of cancers. Kapanidou & Bolanos-Garcia in chapter 02 explain the organization, structure and function of SAC components as this molecular understanding is essential to identify and evaluate new targets and novel strategies for the treatment of cancer. Excessive ErbB signaling is associated with the development of a diverse range of solid tumours. The involvement of the ErbB receptor tyrosine kinases in human cancer has motivated the interest in this receptor family. In chapter 03, Angelucci explains the role of ErbB receptors as a potential therapeutic target in metastasis. This review summarises the recent molecular evidence and the outcome of clinical examinations to demonstrate the potential of ErbB family members. At least 25% of patients with breast cancer develop skeletal metastases, with bone cancer resulting in the greatest morbidity. Bisphosphonates are the treatment of choice in tumour-induced hypercalcaemia, and they can lessen bone tenderness and skeletal complications. Chapter 04 by Brown & Holen summarizes anti-tumour effects of bisphosphonates reported from in vivo models, alone and in combination with other anti-cancer agents. Caveolin-1 (cav-1) is a major structural component of caveolae and it affects diverse signaling pathways regulating cell proliferation, apoptosis, differentiation, migration and growth. Kasper & Barth in chapter 05 elaborate on the role of Bleomycin in inducing apoptosis and senescence in Alveolar Epithelial Lung Cells. This review highlights the issue that bleomycin-induced injury of lung cells is accompanied by altered expression levels of caveolin-1. Chapter 06 by Cazzaniga et al. summarizes the vast array of molecules involved in carcinogenesis and the role of candidate biomarkers in risk assessment and prevention of breast cancer. Costelli et al. in chapter 07 discuss the efficacy of two histone deacetaylase inhibitors, valproic acid and trichostatin A in preventing muscle atrophy associated with certain cancers. Indoleamine-2, 3-dioxygenase (IDO) is an immunosuppressive enzyme and its expression is evident in tumours. Chapter 08 by Liu et al.explains the role of IDO as a mediator of peripheral immune tolerance, and the potential of inhibition of IDO serves as a novel anti-cancer therapy. Association of p53 with Bid induces cell death in response to etoposide treatment. Chen et al.in chapter 09 discuss a novel mechanism of facilitation of Bid nuclear export by p53 and their interaction in the nucleus and the mitochondria to induce apoptosis in response to etoposide-induced DNA damage. Daunorubicin belongs to the group of chemotherapy drugs known as anthracycline antibiotics and is a toxic analogue of anthracycline which is reduced to daunorubicinol (less toxic) by the action of AKR1B10. It was discovered that the enzyme AKR1B10 is overexpressed in some types of cancer. Balendiran in chapter 10 presents the chemical mechanism of action of daunorubicin and proposes a method to advance the effectiveness of daunorubicin by modulating the catalytic activity of AKR1B10. I hope the current volume will provide insights into the development of new approaches to anti-cancer therapy for interested researchers and pharmaceutical scientists. I greatly appreciate the assistance from the editorial staff, particularly Mr. Mahmood Alam (Director Publication) and Mr. Shehzad Naqvi (Senior Manager) for their hard work and determined efforts.